Please say hello and give a warm welcome to our Guest Designer for the In The Kitchen challenge. Nikki Acton of Addicted to Art was the winner of the Impress Us challenge. Hi everyone, it is a pleasure to be guest designer here today at Frilly and Funkie! I live in Hampshire in the UK, work for a small charity and apart from craft enjoy fitness and sport. I have been crafting for a few years now and love texture and paint. I enjoy playing with techniques, learning new ones, rediscovering old ones and generally getting a little messy. My explorations in the craft room, however, do not extend to my kitchen where my skills are very lacking! I am a huge coffee lover so decided to combine this with the classic paint technique of using salt to create my project for ‘In the Kitchen’. 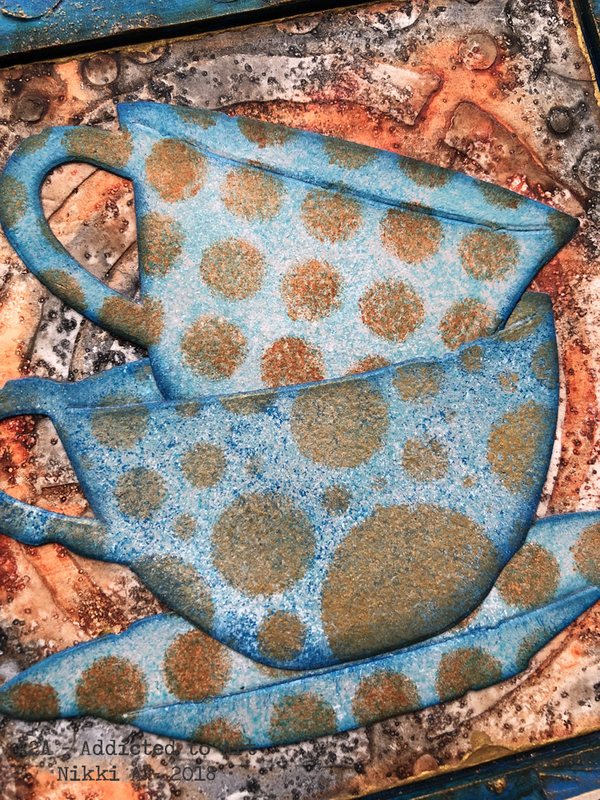 I started by creating some texture on the substrate and border using texture paste. Once dry I added watery washes of paint and sprinkled salt on, leaving it to absorb the moisture and pigment before wiping away once dry. I used this with both the central panel and more subtly on the frame. I die cut the tea cups (coffee in this project!) 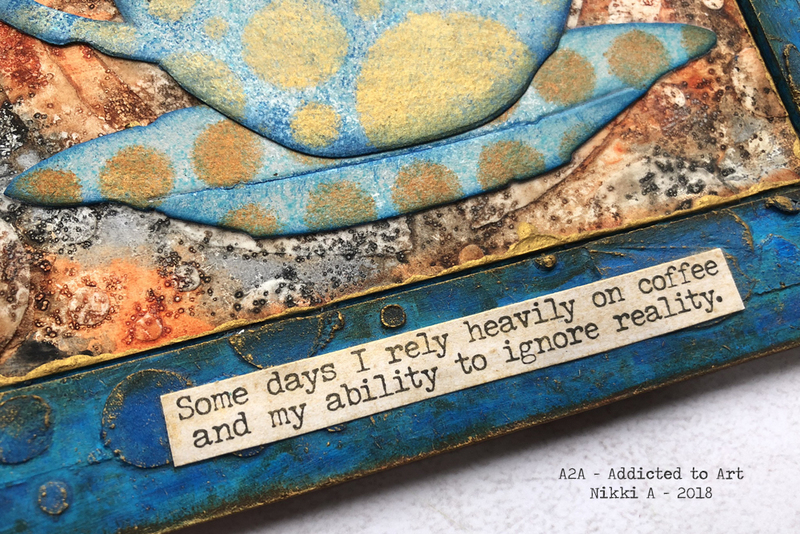 from Tim Holtz’s Tea Time Bigz die and sponged with paint. Gold paint dry brushed on the frame, added to the edge of the central panel with my finger and stenciled onto the tea cups brings the elements together. 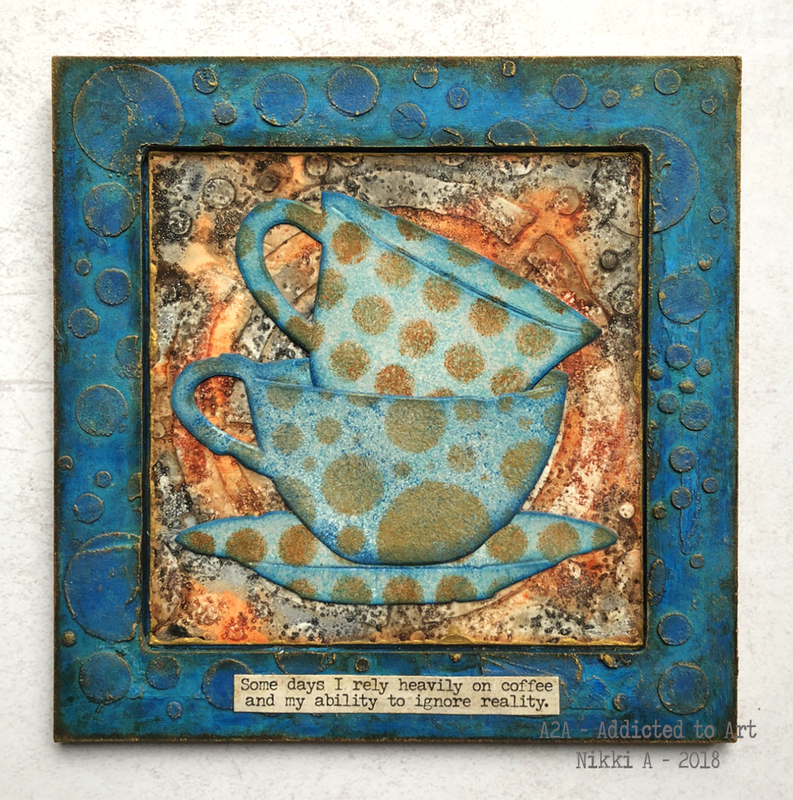 Check out Nikki's blog for details on her fabulous project and then come on back and show us your kitchen inspired make. The challenge, which can be found HERE, runs through 11:55 pm Eastern time on Tuesday, December 18th so there is time to create even with all the hustle and bustle of the holiday season upon us. Don't forget to check in with us often because we always have lots to share. One of our designers will be here on Saturday with a new Saturday Showcase and next Wednesday the gals on the Funkie side of the Design Team will be here with their kitchen inspired creations. Your love for color and texture comes through beautifully in this vibrant, whimsical piece. I just love the teacups! Thanks so much for sharing your techniques and process and for being our guest designer. I' m a fan! Awesome card, love the rustic background! A very sweet set of cups, Nikki! Obviously, your cuppa talent overflows & fills your saucers as well! Who doesn't love the smell of coffee (in any flavor)?!? 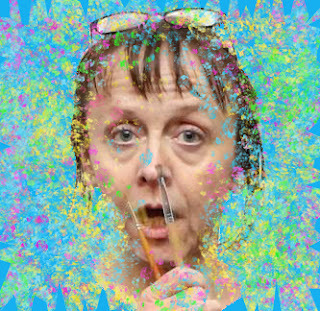 After a couple of days hum-drumming the "what-to-do? "s, I checked in to see this post & got inspired by the tea cups! THANKS!!! Brilliant work from Nikki - that rusty background is incredible. Grungy beauty! 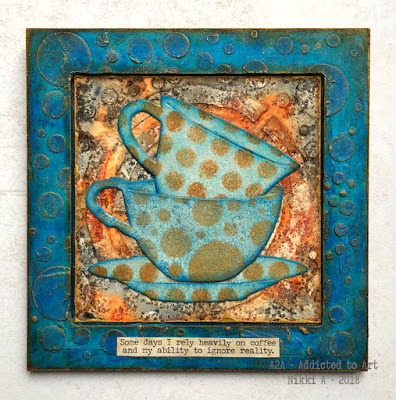 Love the rusty feel of the background and the fab cups!